I can never throw away olive oil bottles, they simply look so elegant! This was one I particularly liked, so I decided to upcycle it into something for the dining table. I coloured the pasta by sealing it in a sandwich bag with food colour and a little vinegar, and shook it really well. When fully dry, it filled it up in layers. I would have preferred using hemp cord on the neck, but I haven't been able to find any here. So, I wrapped it in an old bead necklace! It doesn't look that bad, does it? I think it would make a nice handmade gift too. Thank you, the green came out well! Wow, this is an awesome and unexpected DIY project! I love it! Same here. It's so difficult for me to throw away old bottles and jars, especially if they have an unusual shape. 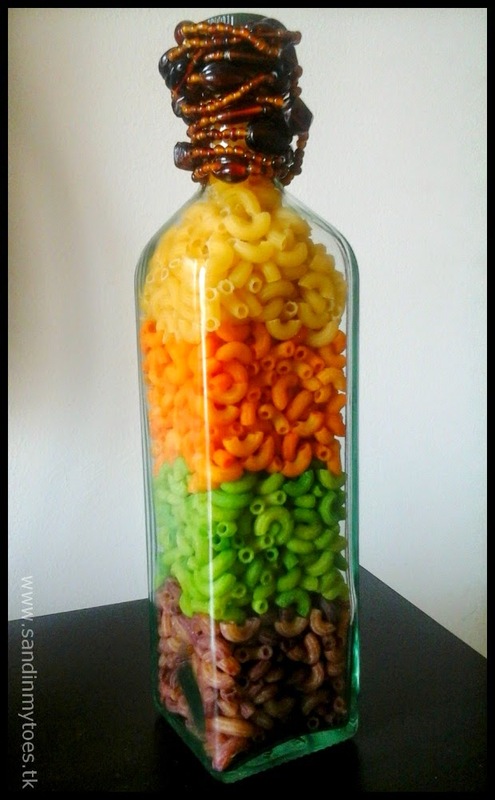 Love what you did with the pasta shells, so colourful! :) #alphabetphoto. I'm only crafty when it's easy! Thanks, yes, the colours did come out well! Thank you, I collect a lot of bottles!